Fun Stampers Journey is having a new collection release April 26 but I purchased the Product Kit and got some amazing stamps and dies! You can still purchase the kit by going HERE. 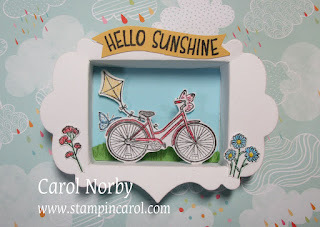 I used a small shadow box die by Spellbinders and the cool new Spring Build-A-Scene stamp set worked perfectly for this! Now this box opening is 1 1/2" x 2" so try to picture how small that is. 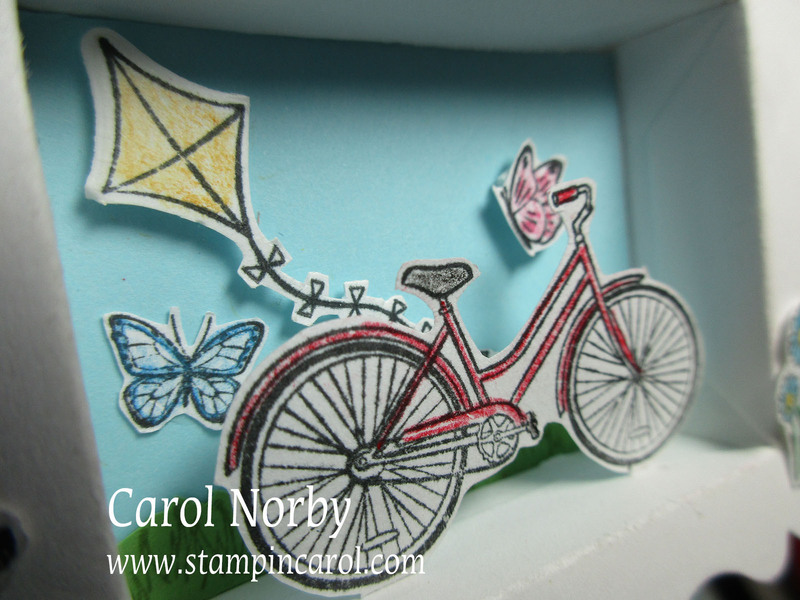 It also is a good point of reference for the size of the stamps! The 2 butterflies are smaller than dimes! I did end up moving the pink butterfly closer to the top right corner for easier viewing. I detail cut my elements as the dies left just a bit too much border around my stamped images. I have to admit that the kite tail was very challenging! I added tabs to the bottom of the wheels on the bike to make it stand. Turned out pretty good, wouldn't you say? You can see the new collection HERE but you can't purchase until April 26 (except for the Project Kit). Now, what shall I do with this?? So cute! Mine just came yesterday.